Guest access is a feature that is available through the Linksys Connect software. Its main function is to help you limit and provide access to guest users to your wireless network. Through the Guest access feature, Linksys Connect users are capable of creating a guest network. Think of it as a duplicate wireless network with settings that are specifically made for guests. The Guest access feature allows you to create a separate guest network. Why would you need to create a guest network? Suppose you have visitors in your home that want to connect to your wireless network. There are chances that they may be able to access certain information which could possibly hamper your network’s privacy and security. The Guest access feature gives you an alternative to Internet connectivity for your guests without compromising the confidentiality of your wireless network. The guest network serves as an alternative option for wireless Internet connectivity. If a computer or a device is connected to the guest network, they are limited to Internet access only. Any other activities like changing wireless settings in the router setup page or file and printer sharing will not be allowed. Those who are connected to the guest network are limited to Internet access only. How can I create a guest network? Take note that this is only available in Linksys Connect. Click on the Guest access window and you will be able to set specific parameters in enabling this feature. • The name of the guest network is based on the main wireless network name (SSID). It comes with a –guest suffix after the name. This cannot be changed. 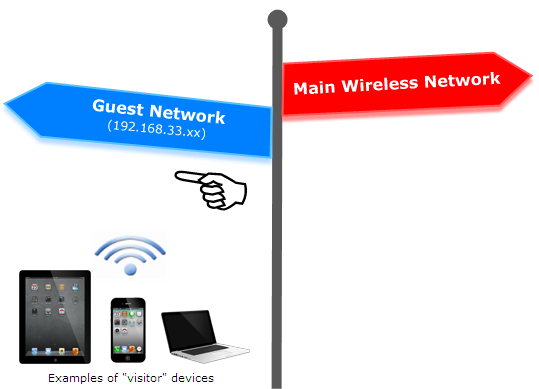 • If you are the one to connect to the guest network, ask the owner of the main wireless network for the guest password. They are the only ones with the exclusive access to the guest network’s settings. • If you are the owner of the main wireless network, the guest password is in the Guest access settings section of Linksys Connect. • You can allow up to 10 guests to access the network. Linksys Connect has other features that can help you manage your wireless network better. One of these is Parental Controls. This feature can help you set specific restrictions to users who are connected to your network. Click on the link below for a better understanding of Parental controls.